emmatree: How many matches does it take to . . .
what a great photograph. that's a lot of strikes. Love the image! How frustrating, though, to have gone through that many matches to light the furnace. Why is it that you get so much rain there? It's almost always dry as a bone here. I guess you'll get that big storm that hitting the SF Bay area in a few days. 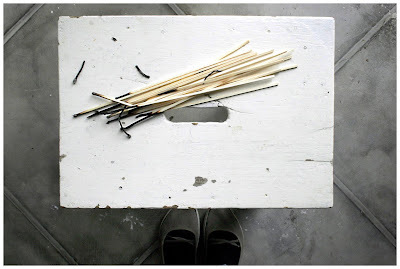 Only you could make a floor, some shoes, and a bunch of old matches beautiful. Only you. You are hilarious...and creative, even when trying to light a few matches! Ok, maybe a little more than a few.